Bored with your apps, looking for something new? 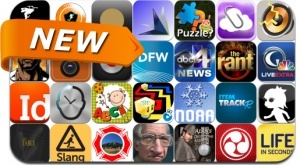 Check out these 35 iPhone and iPad apps that were just released. This new apps alert includes Blink Walk, ShaqDown, Lost Cubes, Blink TV, Alan's Detective Agency, Sundance Film Festival 2013, Remindfulness App, Text Photo, CamAround 360° and many others.